If a list of America’s “forgotten” wars were compiled, the War of 1812 would certainly rank near the top. Thumb too quickly through any United States history book, and you’re likely to skip right past the scant few pages typically devoted to this conflict. 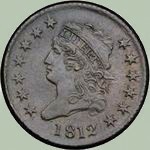 The goal of this article is twofold: (1) Present a basic understanding of the causes, execution, and aftermath of the War of 1812, and (2) Study coinage types issued by the U.S. during those wartime years, how coinage was affected by the war, and to assess modern day collector interest in coins from that long ago era. Napoleon of France began his quest for control of Europe in 1803. Within a span of four years, much of his ambition was fulfilled: only Great Britain and Russia remained in his sights. 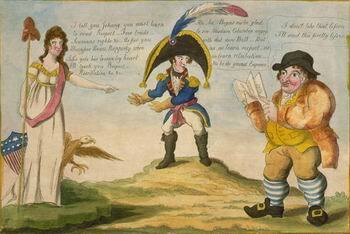 A satire on Anglo-American and Franco-American relations. 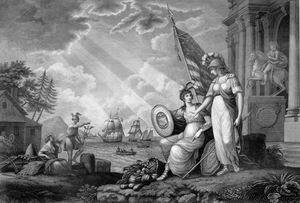 England's (represented by character on right) "lesson" is about the seriousness of American (lady on left) determination to maintain freedom on the high seas, while France (Napoleon, center) is warned of Yankee firmness on matters of "Retribution" and "Respect." Image courtesy of Library of Congress. The biggest challenge facing Napoleon was protecting his supply chain on the high seas, where Great Britain held a major advantage. Much of France’s imports came from the United States, a fact which had not escaped the notice of the British Parliament. In 1807, British lawmakers adopted a series of measures called Orders in Council, which sought to prohibit American ships from entering any port under Napoleon’s control. In retaliation, the French dictator decreed that any vessel doing business with Britain would be confiscated by his forces. American merchants protested, arguing that the principle of freedom of the seas gave them the right to trade with anyone their choosing, and responded by running naval blockades of both nations. The practice of blockade running naturally put the U.S. at odds with Britain and France, but the relationship between the Americans and British in particular soured dramatically following the Chesapeake incident. In the summer of 1807, the commander of the British warship HMS Leopard demanded to board the American frigate USS Chesapeake to search for British navy deserters. When the demand was denied, the Leopard opened fire, killing three and wounding 18 aboard the Chesapeake. Four alleged deserters were then seized, or impressed, and taken away with the Leopard. When news of this outrage reached Washington, D.C., many angry Americans demanded a forceful response. This was not the first time the British had impressed American seamen into their navy, but it was certainly the most violent episode to date. 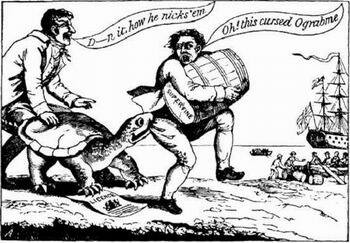 The Embargo Act of 1807 was very unpopular to Americans who made their living through shipping, most of whom lived in the northeastern part of the county. This "O-Grab-Me" cartoon (embargo spelled backwards) expressed their disdain for the Act. Public domain image. Seeking to avoid war, President Thomas Jefferson urged Congress to pass the Embargo Act of 1807, which prohibited American ships from trading with any foreign nation. In effect, the United States temporarily abandoned the principle of freedom of the seas in the hopes of preventing war. Unfortunately, American businesses suffered greatly, and eventually pressured Congress to repeal the Embargo Act on March 1, 1809, three days prior to Jefferson leaving office. The problem of easing international tensions while retaining American rights fell to his successor, James Madison. This declaration of war document against Great Britain, passed by the 12th U.S. Congress and signed by President James Madison, dated June 18, 1812, officially began the conflict later named the War of 1812. Image courtesy of National Archives. The Madison administration’s diplomatic attempts, which involved embargoes and incentives, actually worsened matters between Britain and the United States. The British, however, suffered a severe financial downturn during the winter of 1811-12, following a major grain crop failure. Parliament rescinded the Orders in Council on June 16,1812, with the expectation that resumed American trade would help lift Britain’s economy. At long last, U.S. demands for respect on the high seas had been met. Surely, now, there would be no war between the two countries, or would there? The British had given in to America’s wishes, but because there were no trans-Atlantic cables or telephones in those days, news of Parliament’s actions did not quickly reach Washington, D.C. 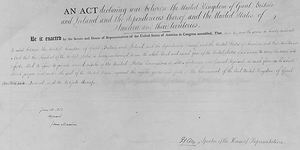 Thus, on June 18, 1812, two days after the British withdrew trade restrictions on America, the U.S. Congress declared war on Great Britain. Pioneer farmers living in what was then the northwestern part of the U.S. were looking for new farmlands, but were not eager to settle the treeless prairies to the west. Rather, the rich, timbered regions of southern Canada were more attractive. 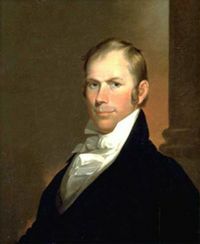 The leader of the congressional "War Hawks" was Henry Clay of Kentucky, who became Speaker of the House in 1811 at age 34. Clay served in Washington until his death in 1852. Public domain image. Further to the south, denizens of those states eyed Spanish Florida, not only for farming potential, but because the peninsula was a haven for runaway slaves and Indians who regularly attacked frontier outposts. A war with Britain might give the Americans a justification for seizing Florida, since Spain was a close friend of Britain. Voters in these hinterland areas reasoned that a successful military campaign against the Redcoats might result in the annexation of portions of Canada and Florida, and thus sent “War Hawk” representatives to Washington to promote their desires. As frontiersmen advanced the sphere of American influence westward, indigenous peoples fought back to preserve their ancestral lands. Encouraged by British agents operating out of Canada, a confederation of Indian tribes, led by a Shawnee chief named Tecumseh, began offering organized resistance. Alarmed westerners demanded retaliation against British Canada to forever dissolve this troublesome alliance. A rising spirit of pride in the new nation also led to the War of 1812. Americans deeply resented British impressment of sailors at sea and foreign insults hurled at the United States flag. Moreover, a substantial portion of the American population believed it was the foreordained destiny of the nation to expand its borders to all extremities of the continent, and were prepared to take up arms to further this cause. Support for the war was far from unanimous, however. Many residents of the New England states, largely represented by the Federalist Party in Washington, refused to support a war against Great Britain, for fear of harming their lucrative maritime trade. Furthermore, New Englanders worried about their shrinking power in the federal government. New territory would eventually lead to new states. Whenever a new state entered the Union, their political clout was diminished. In many respects, the United States was ill-prepared for war, but the lack of unity was the most visible handicap facing the nation. Coinage was not produced in large quantities by the United States during the War of 1812. Of the ten coin denominations stipulated by the 1792 Mint Act, only three of them were struck with any consistency during the war: cents, half dollars, and half eagles. The other seven denominations were scarcely minted or not at all, because of the existence of foreign coin substitutes, bullion weight peculiarities, or other circumstances related to the war. What follows is a review of U.S. coinage types from 1812-1815, the years the War of 1812 was fought, and how their collectible values have progressed in modern times, from the years 1950 to 2009. Planchets for coining the half cent came to the U.S. from England, up until 1811, when worsening relations between the two nations halted shipments. No one really missed the half cent, as economists of the time questioned the existence of the lowly denomination, given their manufacturing difficulty and limited value in commercial transactions (yes, even 200 years ago, a half cent couldn’t buy much). The half cent would not be minted again until 1825, ten years after the normalization of trade following the war. England also provided planchets for the one cent coin, and like the half cent, deliveries ceased prior to and during the War of 1812. Cent production continued, but in smaller quantities. By 1814, the planchet supply was exhausted. In September 1815, about nine months after the close of hostilities, planchet shipments resumed, but this did not allow the Mint enough time to issue cents dated 1815. Thus, 1815 is the only year since the U.S. Mint began regular coinage in 1793 that the one cent denomination was not struck. There are no exceptional one cent rarities from the War of 1812, so the 1813 was selected to represent the one cent coin in this analysis. Photos courtesy of Ira & Larry Goldberg Coins & Collectibles, Inc., Beverly Hills, CA. The production of the half disme (the “dime” spelling did not come into use until 1837) was suspended after 1805. The Mint stopped coining half dismes because of the widespread use of the legal tender Mexican half real (pronounced “ree-all”), worth about six cents face value. Mint officials reasoned that since the public already had an acceptable alternative, further coining of half dismes was not a good use of their limited resources. 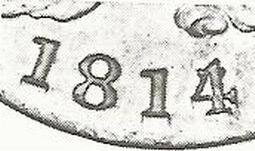 Half dismes were not minted again until 1829. There were no dismes minted after 1811 until the year 1814, when a whopping 421,500 came off the coining presses. The 1814 disme tally nearly exceeded disme production of the previous 18 years combined, since its inception in 1796. No dismes were struck again until 1820. As was the case with half dismes, dismes were not particularly in demand, as their role in commerce was being somewhat filled by Mexican coinage, so why the sudden surge in disme interest? Perhaps someday a researcher will uncover the motivation behind the existence of the 1814 disme. The 1814 was the only disme issued during the War of 1812, but fortunately, many examples survive to this day. There are three varieties of the 1814 disme. The large date variety is examined here. No quarters were minted between 1807 and 1818, with the sole exception of the year 1815, when 89,235 were struck. Similar to the other smaller silver coins, the need for the quarter was largely obviated by the circulation of the Mexican double real, worth exactly the same face value (the phrase “two bits”, meaning 25 cents, originated with the usage of the double real). Mint officials had no plans to produce any quarters in the summer of 1814, when a large shipment of Mexican silver dollars arrived from a New Orleans bank, accompanied by a letter requesting the silver be coined into quarter dollars and returned to the bank. After some hesitation, the Mint delivered more than 69,232 quarters in December 1815, followed by another 20,003 a month later. All bore the date of 1815. For collectors hoping to add a quarter directly connected to the War of 1812 years, the 1815 issue is their only choice. Photos courtesy of Ira& Larry Goldberg Coins & Collectibles, Inc., Beverly Hills, CA. The half dollar was perhaps the most important coin issued by the Mint the first few decades of the 19th century, not just during the War of 1812. Indeed, it became the “coin of the realm”, and was produced continuously throughout the war, usually numbering more than a million pieces annually. A primary reason why the Mint saw fit to produce so many half dollars is because there were no foreign coin substitutes of equal face value to serve the public. Also, half dollars were instrumental in bank transfers. However, only 47,150 halves were struck in 1815, the lowest mintage of the entire Capped Bust half dollar series. The financial burden of paying off the war debt sent the U.S. economy reeling, greatly reducing the demand for coinage. War of 1812 half dollars exist along the full range of the rarity spectrum. Included in this analysis is a common date (1814), a semi-key (1814:4 over 3), and a couple of key dates (1812:2 over 1 large 8, and the 1815:5 over 2). The 1812 half dollar exists in three different varieties. The total half dollar mintage for 1812 was 1,628,059. A tiny fraction of these are the 2 over 1, large 8 variety, which is a key date for this series. There are several varieties of the 1814 half dollar. In addition to the regular date, shown immediately below, there is the 4 over 3 overdate, enlarged in the next table below. The regular date is relatively common, while the 4 over 3 is less so. The 1814 4 over 3 overdate variety is not rare, but it is less common than most Capped Bust half dollars, and qualifies in this study as a semi-key date. The 3 is well hidden under the digit 4. All 1815 half dollars are of the 5 over 2 overdate appearance. All the 1815 half dollars were struck from a modified die left over from 1812. Of all the half dollars minted during the War of 1812, the 1815 is by far the rarest, and is a key date in the Capped Bust series. Silver dollar coinage was discontinued in 1804, and did not resume until 1836. The silver dollar circulated in the United States alongside the Spanish pillar dollar (also called the Pieces of Eight) for a short while, until it was observed by entrepreneurs that the U.S. dollar could be exchanged at par with the pillar dollar in the West Indies. This was a profitable scenario, for the U.S. dollar weighed less and contained a lower percentage of silver compared to the pillar dollar. Traders deposited their pillar dollars at the Philadelphia Mint, where they were re-coined for them into a larger number of U.S. silver dollars. The new silver dollars were exported overseas, where the cycle repeated itself. Taking note of this abuse, Mint Director Elias Boudinot suspended coinage of the silver dollar in 1804, a move later affirmed by President Thomas Jefferson. The 1792 Mint Act set the silver/gold ratio in the United States at 15:1, much in line with the European markets. In 1803, France adjusted the silver-to-gold ratio to 15.5:1, making it profitable to export American gold coins to France for melting. Because so many gold coins left the country as soon as they exited the Mint, U.S. gold coinage was greatly curtailed throughout the earliest decades of the 19th century. Quarter eagle production ceased after the one year issuance of the Capped Draped Bust type in 1808. U.S. gold coin exportation intensified during the War of 1812, when the silver/gold ratio in Europe was elevated to more than 16:1. Quarter eagle production resumed on a small scale in 1821, by which time the uncertainty of war and economic turmoil had long subsided. The half eagle was the only U.S. gold coin struck during the War of 1812. Some demand existed from banks seeking half eagles to hold in reserve and to make international payments. About 170,000 “fives” were coined during those turbulent years, a considerable sum indeed by comparison to its contemporary coinage. Of that total, only a tiny fraction, perhaps 1% or so, survives to this day because of heavy melting losses influenced by the same European bi-metallic ratios that spelled doom for so many U.S. gold coins. Representing the half eagles in our War of 1812 coinage study are a relatively common date, the 1812 Draped Bust, and an exceedingly rare specimen, the 1815 Capped Head. 1812 was the final year for the Draped Bust series. Though it may be a relatively common date for early half eagles, it can still command thousands of dollars in lower grades. One of the classic American numismatic rarities is the 1815 half eagle. Of the 635 original mintage, only 11 pieces are believed to exist today. The ten dollar gold eagle was the largest United States coin denomination mandated by the 1792 Mint Act. More than 130,000 eagles were struck from 1795 to 1804, but most of them eventually perished in the melting pot. None were produced again until 1838. It is a safe assumption that even had gold eagles existed in abundant quantities, few combatants in the War of 1812 would have carried any of the coins, for ten dollars represented a princely sum in early 19th century America and was not typical pocket change for a battlefield soldier or midshipman. When gold eagle production restarted in 1838, it was characterized by a lighter coin of less gold purity, a move designed to frustrate bullion profiteers. As wartime costs mounted with no end in sight, much of what little coinage there was nearly disappeared from view as specie (i.e. silver and gold coins) became tightly held. Banks suspended specie payments in 1814, because the supply of bank notes being issued to finance the war increased faster than the volume of specie reserves. Confidence in banks and the economy were shaken badly, but the situation improved when Congress chartered the Second Bank of the United States in 1816. The Second Bank helped stabilize the nation’s financial system, and by early 1817, banks resumed specie redemption of their paper notes. 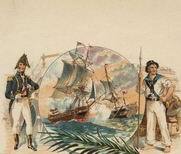 Collectors of today look at coinage from the War of 1812 with a somewhat mixed view. Some of the coins show steady growth over time, counterbalanced by a few that are just as likely to retreat in value over any given period. The value trend analysis is summarized in the last section. The United States was not ready to take on the British Empire in 1812. As mentioned already, the country was badly divided. Most northeastern states contemptuously decried what they called “Mr. Madison’s War”. What’s worse, the military was in no position to confront anyone, let alone a major military power. The army and state militias numbered only about 7000 men at the outset of the war, most of them poorly equipped or trained. The navy’s dozen ships seemed no match to the 800 warships of the British Royal Navy. In retrospect, the U.S. faced dim prospects of ever accomplishing all of its pre-war objectives, but nevertheless, quickly launched into full combat mode. The first major fighting of the War of 1812 was the American attempt to invade British Canada in the summer of 1812. The incursion was not only repelled, but the United States actually ceded ground, loosing Detroit to a combined force of Redcoats and Native American warriors led by the Indian chief Tecumseh. The following year, the Americans reclaimed the lost territory when a freshly constructed small naval fleet, under the command of Captain Oliver H. Perry, surprised the British on Lake Erie. “We have met the enemy and they are ours”, wrote Perry in a report to his superiors, remembered to this very day as one of the proudest moments in all of United States naval tradition. Marine view showing American fleet, under the command of Oliver Hazard Perry, engaged in battle with the British on Lake Erie on September 10, 1813. Image courtesy of Library of Congress. The loss forced the British to abandon Detroit, and the Americans pursued them into Canada. At the Thames River, future U.S. President William H. Harrison defeated the British and their Indian allies. In the battle, Tecumseh was killed, and with his death, his confederation of Native American tribes disintegrated. Throughout the remainder of the War of 1812, the U.S./Canadian border was largely fought to a stalemate. 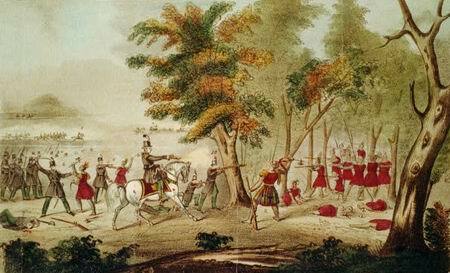 Battle of the Thames and the death of Tecumseh, by the Kentucky mounted volunteers led by Colonel Richard M. Johnson, Oct 5. 1813. Image courtesy of Library of Congress. By the summer of 1814, British landing parties were ravaging towns up and down the Atlantic coastline. In August, a force of some 4000 Redcoat regulars marched on Washington D.C. After casting aside feeble resistance, the British set fire to the U.S. Capitol building, the White House, and other government facilities. Drawing shows the ruins of the U.S. Capitol following British attempts to burn the building; includes fire damage to the Senate and House wings, damaged colonnade in the House of Representatives shored up with firewood to prevent its collapse, and the shell of the rotunda with the facade and roof missing. Image courtesy of Library of Congress. In a serious blow to national pride, President Madison and other federal officials were compelled to flee to the safety of countryside. With little time to evacuate, the President’s wife, Dolley, instructed her aides to secure the famous Gilbert Stuart portrait of George Washington, lest it fall into enemy hands. As the flames intensified and all seemed lost on the American side, a torrential rainstorm struck the city and dowsed the inferno, preserving most of the buildings from total ruin. Washington was saved by Mother Nature. After sacking Washington, the British next targeted Baltimore. No conquest of the city was possible without first vanquishing Fort McHenry, which guarded the entrance to Baltimore’s harbor. The troops manning the fortress were determined to hold off the invaders, and to show their spirit, unfurled a giant 30’ x 42’ American flag, visible for miles. 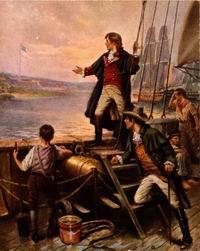 Francis Scott Key observes U.S. flag still flying above Ft. McHenry, on the morning of Sept 14, 1814. Image courtesy of Library of Congress. On the morning of September 13, 1814, British warships unleashed a ferocious bombardment of Fort McHenry. The defenders held strong as the shelling continued all day and into night. It so happened that an American lawyer named Francis Scott Key, temporarily detained behind the British fleet, observed the battle from afar. As the evening wore on, the red glare of rockets lit the darkness, proving the U.S. flag was still flying. A few hours after midnight, the bombing stopped, followed by an anxious silence. At the first glimmer of dawn’s early light, Key was thrilled to see the great star spangled banner gently blowing in the breeze… the British had given up their assault on Baltimore and were heading back to sea. Inspired by this dramatic outcome, Key quickly scribbled some poetry on the back of an envelope, words that would someday become the United States national anthem. The British high command decided the capture of the port city of New Orleans would help tilt the outcome of the war in its favor. With this in mind, a force of nearly 10,000 troops was dispatched from Jamaica to attack New Orleans. American general Andrew Jackson hastily assembled an odd assortment of 5400 men, composed of woodsmen, pirates, sailors, “free men of color”, and a few regulars. Jackson set up a defensive position a few miles outside New Orleans, shielding his army behind a newly dug water trench and stacked cotton bales. On January 8, 1815, General Edward Pakenham led the British charge against the American stronghold. Waiting patiently, Jackson’s men held their fire until the last possible second, mowing down the first line of Redcoats. Wave after wave met the same bloody fate. By the time the British retreated from the battlefield, Pakenham was dead, and about 2000 of his men were killed or wounded. American killed numbered no more than a few dozen. 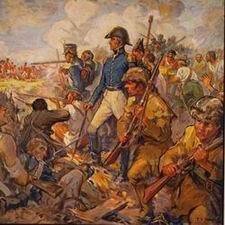 The Battle of New Orleans was the largest engagement of the War of 1812, and was won decisively by the United States. Andrew Jackson quickly became a national hero, riding his fame all the way to the White House in 1828. Peace talks between the warring nations began in August 1814 at Ghent in Belgium. Both sides sought territorial concessions, but in the end, no land changed hands. Negotiations were fought to a draw, somewhat mimicking combat results. Language in the treaty primarily called for a cease of hostilities, and did not even mention impressment of American sailors or freedom of the high seas. The Treaty of Ghent was signed on December 24, 1814, but did not reach the United States in time to prevent the Battle of New Orleans. Ironically, the largest battle of the War of 1812 took place after hostilities had officially ended! The pre-war embargoes and British naval blockades forced American manufacturers to begin making goods of the type formally imported from Europe. Factories, most notably in the northeast, began to thrive, and interstate commerce became a large business. The Treaty of Ghent did not directly resolve any disputes between the United States and Britain, but did provide the framework for negotiated settlements later. Within a few short years, important agreements were reached on maritime rights, international trade, and Canadian border policies, all stemming from the Ghent armistice. These agreements set the foundation for a lasting friendship between the two nations, which has continued to the present day. 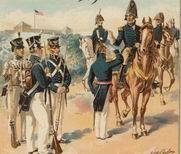 Banding together to hold off a major world military power, the American people emerged from the War of 1812 with a much stronger sense of unity. "America Guided by Wisdom", depicting Minerva, America, Ceres, and Mercury allegorical representing prosperity and independence after the US victory over Great Britain. Published in 1815. Image courtesy of Library of Congress. Andrew Jackson’s clear victory at New Orleans punctuated the United States’ strength and ability to defend its right to nationhood. The war’s outcome also sealed the doom of the Federalist Party. Their anti-war diatribe was viewed by many as treasonous, causing membership in the party to evaporate and left the Democratic-Republicans (the forerunner of today’s Democrats) as the only influential political party in America. So unified was the country, the period 1817-1825 came to be called the “Era of Good Feelings”. President James Monroe won reelection in 1820 running virtually unopposed. The time following the War of 1812 was like no other in the history of the United States. Finally done with European entanglements, Americans vigorously accepted the challenges of opening new frontiers to the west. Patriotism and excitement abounded, leaving political strife mostly behind. Technological innovations and factories brought jobs to many in the northeast, and agriculture, particularly cotton, gave rise to southern prosperity. For a short while, the American people were unified in a sense of national purpose, but as different sections of the country developed differently and took on competing social visions, the bonds holding the country together weakened with the passage of time. Disagreements led to rancorous debate, which tragically, spawned a civil war of devastating proportions in the 1860’s. * Please note the 1815 Half Eagle is a special exception; because it is a classic numismatic rarity, developing meaningful value trends is tough because the coin is traded so infrequently. The last sale of an 1815 Half Eagle occurred in Jan 2009, when an MS-64 example sold for $460,000. Coin collectors hoping to obtain artifacts from the War of 1812 that also have some upside potential are advised to concentrate their purchases to the coins at the top of the list. As always, a good rule of thumb is to obtain the best properly graded condition affordable. Do not be disappointed or surprised if your new purchase stagnates or actually recedes in value in the near future. As with most markets, coin pricing moves in cycles, with strong collector pressure pushing certain coins to increasingly greater heights over long periods of time. Whether your desire is to hold your War of 1812 coins as if they were commodities and hold until profit objectives are met, or if you intend to pass the coins on to your heirs, always remember the connection your coins have to a unique time in American history. The War of 1812 was a very perilous event for the United States; had it not been for a propitious rainstorm hitting Washington DC on August 24, 1814, or for a handful of stubborn patriots defending Fort McHenry a few days later, who knows, America may well have been reclaimed as a British colony. Had history taken another path, one just as easily traveled, the War of 1812 coins might have been the final coins ever minted by a short-lived, long ago forgotten republic called the United States of America.